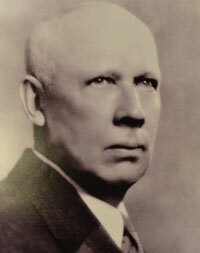 Our company’s founder, Albert L. Dunn, was born in 1869 in the small northern Wisconsin town of Rhinelander. He was the youngest of eight children born to Edward and Lucy Dunn and his father died before he was born. As a teen, Albert apprenticed in a local hardware store. When he finished secondary school and business college, he was a bookkeeper and bank teller before becoming a partner in the Dunn and Woods Hardware Company and marrying Mary Stevens, the daughter of a local sawmill owner, in 1898. In 1907, Albert sold his share in the hardware store and formed Dunn Lumber Company, in Rhinelander, where he acted as sales broker for local sawmills. In 1910, he decided to relocate to Seattle, Washington, a boomtown with abundant timber and numerous sawmills. In later years, Albert represented the Phoenix Shingle Company, located in Ballard, and he sold their output across the country. By the time Albert and Mary moved to Seattle, they had four children, three boys and a girl; a second girl was born shortly after their move. Mary Dunn, who had been a schoolteacher before her marriage, made sure all of her children were good students and all five graduated from the University of Washington. The three boys received degrees in forestry and, during their college years, worked as loggers in nearby forests. The two eldest boys, Charles and Ed, began their careers with a lumber retailer in California. 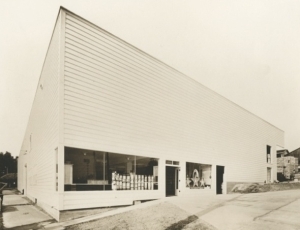 In 1927, they returned to Seattle to partner with their father in creating a retail storefront for Dunn Lumber. Their first location was in an old barn east of what is now the shopping center, University Village. 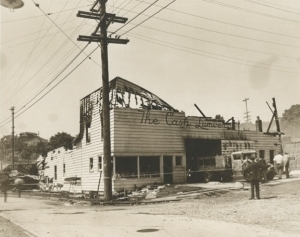 In 1931, they purchased the Holmes Lumber and Fuel building on the north end of Lake Union. Seven years later a fire destroyed all the lumber sheds, inventory, equipment, and offices. Fortunately, Charles and Ed had excellent insurance and were able to rebuild immediately. They hired crews of carpenters to work two shifts a day and in just twelve working days they had a new 18,000 square foot building. 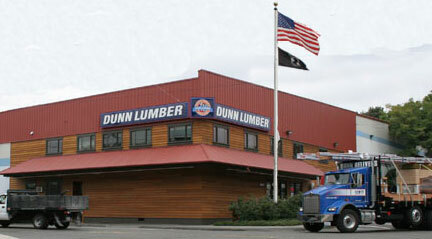 After many additions and modifications to the building, it continues to operate as the busiest Dunn Lumber branch. The Great Depression descended upon Seattle not long after the relocation of the business to the Lake Union site. As the economy contracted and business volume fell, Charles and Ed realized they needed to either change the way they were doing business or they would soon be forced to close the doors. It was common practice for retail lumber outlets to extend credit to building contractors, but many contractors became unable to pay their suppliers as the depression deepened. The Dunn brothers decided to take the radical approach of selling for cash only, and they closed all credit accounts. In addition, they each cut their own monthly salaries by half, to just $50 per month. The business lost money for the first six months, but turned the corner and remained profitable for the remainder of the depression. A few years later, the slogan “It Pays to Pay Cash” was advertised widely and used for many years until the arrival of credit cards in the 1970’s. As the country emerged from the depression and World War II, the Seattle economy exploded with growth fueled, to a great extent, by The Boeing Company. Charles and Ed began expanding the business by purchasing and building additional locations. The growing affluence of homeowners brought many do-it-yourselfers into lumber yards, and Dunn Lumber became known as a source for good advice and quality materials at a fair price. The 1990’s saw the emergence of Home Depot, Lowes, and other national “box stores” that changed the face of the building materials market forever. Many independent stores and regional chains fell by the wayside as these national chains rolled into the area. Dunn Lumber’s response was to focus even more effort on offering exceptional materials and service. We work hard to establish and maintain one-to-one relationships with customers while offering expert advice to help homeowners and professional contractors finish their projects on time and on budget. Today the business remains family owned and operated. Charles and Ed Dunn are both gone and Ed’s sons have all retired, but several members of the fourth and fifth generation continue to work in the business with Mike Dunn as president. Still local and still family owned and operated for over a hundred years!